The GTA Vice City Chain Game is a Forum-Based Relay Game for Grand Theft Auto Vice City, a 2002 Video Game published by Rockstar Games and developed by Rockstar North. 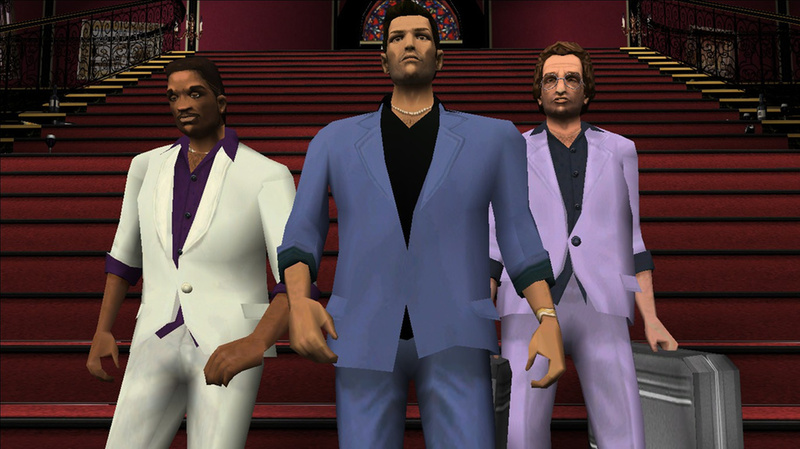 The Goal of the GTA Vice City Chain Game is to complete Grand Theft Auto Vice City "from Zero to Hero"; from the very beginning to the very end and, eventually, achieve 100% Completion. The GTA Vice City Chain Game is free to play for anyone who desires to participate. 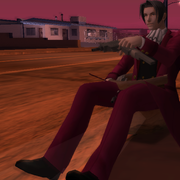 Every potential participant must have the PC Version of Grand Theft Auto Vice City as well as connection to the internet to be able to play. Other than that, there are no prerequisites at all. However, all participants should take time to read the Rules or, at the very least, the Quick Start Guide before they start to play. 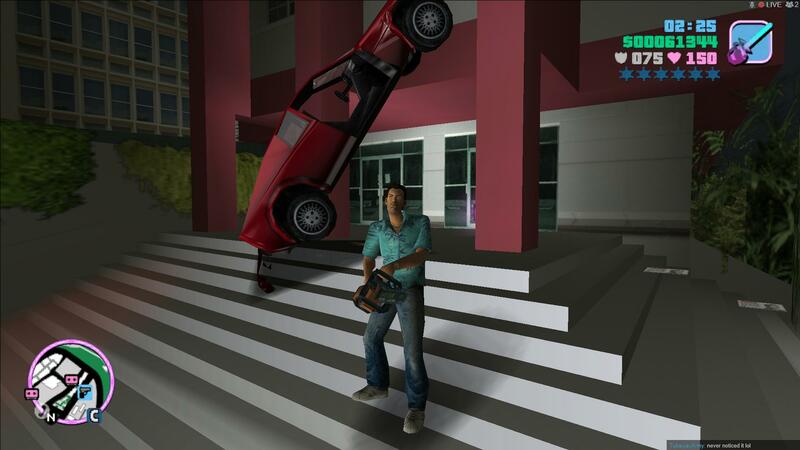 The Rules are designed so that the game can progress smoothly and everyone can have an enjoyable experience of contributing into achieving the Chain Game's Goal, which is reaching 100% Completion in Grand Theft Auto Vice City. New Players are always welcome to join the Chain Game. If you're new and are willing to participate, simply look through the Quick Start Guide and read the complete set of Rules later. Eventually, the Chain Game Rules will have to be read though, otherwise you will spoil all of the fun for the other players and also yourself. 1. DO NOT use any kind of cheats, trainers, modifications or CLEO Scripts during your turn. They can sometimes cause serious damage to Save Files which will not only spoil the fun for yourself, but for the other players as well. 5. The Zero Failures Rule: DO NOT save your game after having been busted or wasted, or after using the cheats. Saves that do not match these prerequisites will not be accepted. 6. The One Named Mission Rule: Complete One Named Mission Only throughout the duration of your turn. A Named Mission is any mission that changes the save file name. For Example, "Riot", "VIP" or "Cap The Collector". Several Named Missions are exceptions from the One Named Mission Rule. You will find all relative details in the Supplement To The Rules. 7. The Two Turn Wait Rule: Wait until two other turns have been completed before taking another turn. 8. The Three Hours Limit Rule: The time limit to complete any turn is three hours. The timer starts as soon the player has made a post indicating he/she has taken a turn. The player's deadline is defined by the time of his/her post. If three hours pass and the player does not post the save, his/her turn is declared "Invalid" and anyone else can take a turn. 9. 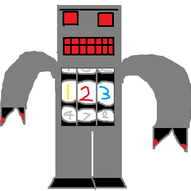 The Four Hour Timer Rule: If four or more hours pass since the last turn was completed, then the Two Turns Wait Rule is no longer in effect and anyone can take a turn - even if it is the player who completed the previous turn. 10. Any player can willingly forfeit. To do so, the player has to edit his/her post and write a corresponding text. The forfeiter should skip at least one next turn or wait until the Two Turns Wait Rule is no longer in effect before he/she can take a turn again - Note that the forfeited turn does not count towards the Two Turns Wait Rule sequence nor does it cancel its effect. A forfeited turn does not affect the Four Hours Timer Rule as well, meaning that the Two Turns Wait Rule loses its effect 4 hours after the last valid turn is completed. 11. In the event of two players taking a turn at the same time, the one who posted earlier has the turn. 12. Mission Strategy is solely up to the Player - Just Refrain from using any kind of cheats, trainers, modifications or CLEO Scripts during your turn. 13. The player can purchase weapons, tools, clothes, food, safehouses, businesses, respray the vehicles, set up the bombs and have relations with prostitutes. The decision about whether any of this information should be mentioned in the Notes section of the post or not is solely up to the player. It is recommended, however, to mention some important information just in case. 14. The player can do any available side missions (with several regulations found in the Supplement To The Rules applying) in his/her turn, either separately or along with any Named Mission. It is recommended to report any completed side missions and rewards received for completing them in the Notes section of the post. 15. Nobody is forbidden to get to Mainland and Starfish Island any techniques possible to access these islands before they are open, unless these techniques involve explicit cheating or use of third-party trainers. 16. It is highly essential not to trash this topic with unnecessary comments and replies, and instead keep it focused on the game itself. If somebody have something to say or ask about the Chain Game or GTA Vice City in general, or there is a technical issue need bringing up, post in the Chain Game Lounge. If the mission failure was nothing more than a result of the player's bad luck, it is recommended for him/her to restart the turn, unless a very large amount of side missions have been completed up to the point of failure without the player saving a single time in which the Chain Game Chief may allow that Player to finish and post their turn with the Mission Failure Present. 3. It is recommended that the Players try to save the game with full body armor. If you have lost some armor during your turn, take time to search for armor pickups or just collect them from hideouts if they are already available. 4. Try to keep the ammo count below 10000. When exceeded, the ammo count will disappear. This can sometimes be lethal during missions where you engage in a heated fight with only 5 or 6 bullets left in your clip which you can't see and reloading can cut down your health or armor. The exceptions are one-bullet-clipped weapons: Molotovs, Grenades, Remote Grenades, Shotgun, Stubby Shotgun, Rocket Launcher & Sniper Rifle. Also, as soon as the 'fast reload' ability will have been unlocked, these regulations will become obsolete. This Supplement to the Rules is designed to discuss some of the technical issues of the Chain Game's rules and of Grand Theft Auto Vice City overall. Anybody that violates the Chain Game Rules, spams in the Chain Game Topic or doesn't show Respect for the Chain Game Players will be dealt with by the Chain Game Management Staff and will result in a temporary or permanent exclusion from the GTA Vice City Chain Game in which during that time, no turns that the player makes will be deemed valid, even if they respond to every single rule of the Chain Game. Although this is a named mission, as it changes the save file name, there isn't any action going on so it can be accepted in combination with the next Storyline mission, "The Party". After completion of this mission, the Haitians will hate Tommy and will attack him on sight. It is highly recommended to postpone this mission for as long as possible, so as to complete as many other storyline missions and side missions as possible in the borough of Little Haiti in the meantime. This section introduces regulations to side missions in the game, so as to avoid turns with excessive amounts of side missions completed. The player can complete NO MORE THAN ONE STADIUM MISSION at a time, regardless of anything else completed in his/her turn. These missions can also be re-accepted by other players to improve record times. The player can complete NO MORE THAN ONE CHALLENGE at a time, regardless of anything else completed in his/her turn. These challenges can also be re-accepted by other players to improve record times. The player can complete NO MORE THAN ONE TOPFUN MISSION at a time, regardless of anything else completed in his/her turn. These missions can also be re-accepted by other players to improve record times. The player can complete NO MORE THAN TWO RACES at a time, regardless of anything else completed in his/her turn. These races can also be re-accepted by other players to improve record times. These missions are free from regulations, and can be combined in any number with any other amount of side missions. These missions can also be re-accepted by other players to improve record times. These missions are free from regulations, and can be combined in any number with any other amount of side missions. Checkpoint Charlie can also be re-accepted by other players to improve record times. Thes missions can be combined with any storyline mission as well as with any amount of side missions during the turn. Each of these missions can as well be done in a separate turn upon the player's choice. It is strongly recommended to complete these missions as early as possible in the game, so that the rewards granted upon their completion will be of more use during the remainder of the game. It is also recommended to mention whether these missions have been completed in the Mission section of the post. The decision about writing down the rewards received for these missions is up to the player. Feel free to get/complete any amount of these during your turn. These can be either done separately or can be accompanied by a storyline mission and/or any amount of side missions. It is also recommended to write down the locations of any found Hidden Packages, completed Rampages, completed Unique Jumps and/or robbed stores (provided the player does not get all of them at a time), as well as mention any rewards received for them into the Notes section of your post. All players are allowed to participate in delivering vehicles once Sunshine Autos is bought, and this can be done either separately or along with any storyline mission and/or any amount of side missions. Players can also help by storing vehicles needed for the lists beforehand when they come across them. In a situation where a player completed a turn but forgot to mention something essential he/she did during his/her turn completion, this player is advised to edit that post. After that, the Original Edit Time line should be added at the bottom, showing the time when the turn was originally finished. The Steam Version of GTA Vice City has a slightly altered Save File Format compared to all other versions of the game on PC. These differences mean that using a Retail Save on the Steam Version of the game will start a new game when loaded rather than loading the actual save file, and that using a Steam Version Save on a Retail Game would result in a Crash. It's important for all players to note that the VC Chain Game is likely to have a range of players with some using the Retail Version and some using the Steam Version to play. Fortunately, GTASnP.com includes an easy to use Save File Converter that all players can use to download the previous players Save File in a format that will work on their game, even if the player above is using a different version of the game. This allows for the VC Chain Game to have a range of players on different versions of the game without any confusion being caused when downloading the previous players save file. More information on how to convert the save files when playing can be found in this post. Later versions of the game (released after 2012) have a list of songs (including the legendary "Billie Jean" by Michael Jackson) removed. It is unknown whether the newer games won't cause any issues with the Chain Game save, created on the 2003 Original Version of the game. Following an ethnic scandal involving attitudes towards the Haitians in the game, the Haitians have been largely cut out of the game's later releases. It is yet unknown whether playing a "Haitian-friendly" release of the game causes issues in the Chain Game saves. The glitch is as follows: upon completion of either "Cop Land, "No Escape?" or "The Job", providing the "Two Bit Hit" mission has been completed beforehand, the Havana Outfit pickup will be misplaced, making it impossible to pick it up ever again. To avoid this glitch from happening, "Cop Land", "No Escape?" and "The Job" must be completed before "Two Bit Hit". The glitch consists of two parts. Part 1: If "Trial By Dirt" is completed before "Test Track", the record time for "Trial By Dirt" will not be displayed in the STATS menu. If "Test Track" is completed afterwards, only the record time for "Test Track" will be displayed in STATS menu. Completing "Trial By Dirt" one more time will cause Part 2 of the glitch to happen. Part 2: If "Trial By Dirt" is completed after "Test Track", the record time for "Trial By Dirt" will actually represent the record time for "Test Track", with the record time for "Test Track" being also displayed in the "STATS" menu. Attempting "Test Track" again will overwrite both the record times while attempting "Trial By Dirt" will not overwrite any records. The following list is to make players aware of which items have already been unlocked from collecting Hidden Packages in Vice City and which are still not available. The unavailable items will have the requirements on how to get them in the brackets next to the item's name. The following vehicles are unique and therefore most of them can only be acquired once during the game. The GTA Vice City Chain Game players can acquire any of these vehicles at their own leisure. Note that Unique Vehicle acquisition is NOT a requirement of playing the game. Spand Express (U) - "Jury Fury"
Spand Express (U) - "Riot"
Diaz's Silver Admiral (BP/DP/EP/FP/EC) - "Guardian Angels"
Black & Pink Bobcat (EC) - "Autocide"
Surf Blue PCJ-600 (EC) - "Autocide"
Light Blue Maverick (EC) - "Loose Ends"
Hilary's Sabre Turbo (BP/EP/FP) - "The Driver"
Gold Stretch (EC) - "Recruitment Drive" and "Martha's Mug Shot"
Mission: Use the Mission Name as it appears on the screen. Do not use mission descriptions such as "the mission where you plant bombs with a RC Helicopter". Rampages Kill 30 Gang Members in 2 Minutes! [Molotov] in Vice City Beach, Kill 25 Gang Members in 2 Minutes! [.357] and Kill 30 Gang Members in 2 Minutes! [M60] in Mainland done. Ooh, chain game! Oh, how I missed you so. Finally, I shall take a turn! And it'll be live! Do we still do that? Well, either way, it'll be live. Completed the PCJ Playground challenge. $1,000 earned. Time - 1:41. Saved at the Ocean View Hotel. Link: "I ain't got no sun tan"
Received a Phone Call from Sonny! Done Runover and Kill 30 Gang Members in 2 Minutes! [Vehicle] in Vice City Beach. Tommy's a golfer now. He's found his true calling in life. Not many workers were injured in the making of this turn. Those who missed the stream missed my expert driving skills! Turn as @TubewayArmy never noticed it lol. Notes: This mission doesn't make sense, she can exit the car. Done Kill 25 Gang Members in 2 Minutes! [MP5] rampage in Vice City Beach. Notes: Done ALL rampages in Starfish Island (wow) and 2 in Vice City Beach: Kill 25 Gang Members in 2 Minutes! [M4] and Kill 30 Gang Members in 2 Minutes! [Rocket Launcher]. Paramedic Complete - We will never get tired! Destroy 10 Vehicles in 2 Minutes! [Rocket Launcher] rampage in Vice City Beach completed. Bought Pole Position, InterGlobal Film Studio and Malibu Club, completed Pole Position. Received Phone Calls from Lance!